Our friend Hanna hosted our family for dinner and piano playing the other evening. Not just our family, but also Andrew and Yuri who were visiting us from New York. Hanna is the white-haired professor with saucy red glasses who led us through our visa trials with humor and grace, and we wanted her to meet our old friends from home. Both Andrew and Yuri had attended conservatory to train in their instruments (French horn, flute) but each later turned to piano as an outlet better suited to home life and occasional practice. They work in fields beyond music and play piano when they can. Hanna is learning piano in her retirement. We’d been looking forward to this gathering all week. Andrew, M, and C prepared their piano pieces in the days leading up to Saturday, taking turns practicing on the out-of-tune upright in our bedroom with the door closed, the music leaking through. Yuri didn’t join them in the practices, opting for more time to make Froebel stars out of paper strips, a craft project left over from Christmas. There was no particular pressure to this evening’s performance, and even the practices leading up to it had seemed like indulgences, each person slipping away to be alone and make music for a bit. We were the only guests for the meal, and the piano entertainment was only for each other. We arrived and after greetings and introductions, arranged ourselves in Hanna’s office, though that can’t be the right word for the cozy niche she has carved out of her flat; it contains two small desks, an upright Bechstein, an assortment of comfortable chairs, windows to a balcony full of blooming plants and the street below, sculptures on the floor, and paintings on every wall. We made ourselves comfortable and the playing soon began. Andrew went first, playing two pieces he says he thinks of as a set, first the slow movement from Beethoven’s Opus 13 (the Pathetique sonata), a piece I recognize from childhood somehow, then the slow movement of a Mozart sonata. He played with ease. It was a joy to watch him from where I sat, able only to see the back of him, and observe how unaffected he is and always has been, playing for the pleasure of it, comfortable among friends. In addition to Andrew’s playing we could hear the sounds of a street fair below drifting in. On our way to Hanna’s building we had passed street vendors selling crafts, and wooden tables and chairs had been pulled out to make a temporary street café; people were seated drinking beer and talking just below her windows. A band was playing around the corner by the S-Bahn entrance, far enough away to not interfere with the piano music. 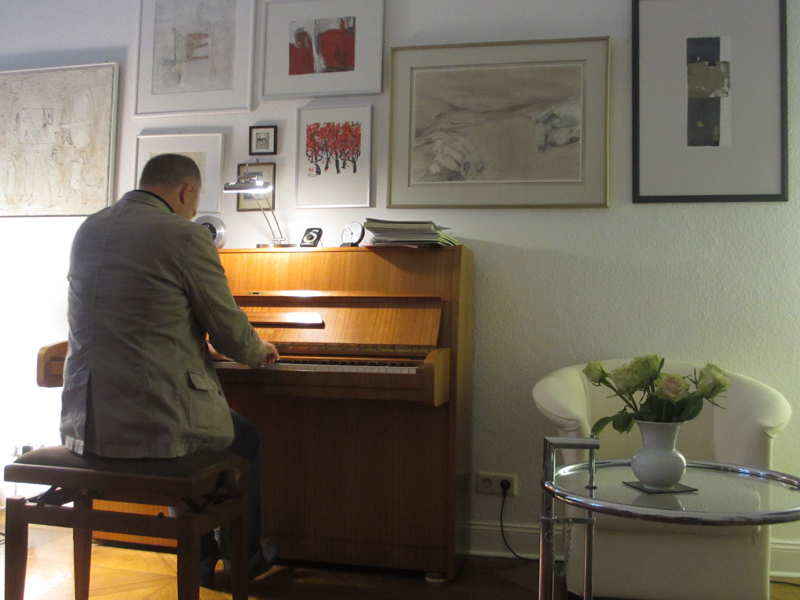 The essence of Berlin seemed to be unfolding just outside Hanna’s windows, while inside it was a warm and lovely space where friends old and new were making music for one another. Because of the way the room is set up, Andrew faced the wall when he played, leaving his small audience free to look where they wished—at him, or out the window, or at the abundant art on the walls. I stared at Andrew’s back for a while and the shape of it made me recall the back of a jeans jacket I once had in high school, how I had wanted to paint a woman’s face onto the middle section of the material, but never got up the courage to take paint to my beloved jacket. I looked around the room and followed the line of paintings Hanna had hung across the entire wall before us. I admire original art in a home, knowing the owner values creations; I find it is more moving to see oil paint piled thick on a canvas in a friend’s living room than in a museum, knowing that if you wanted to you could put your finger up to it, almost touching it, if you wished, and no alarms will go off. It’s freeing to sit among the creations of others; I think it stirs your own creative impulses. Piano music played right before you is another creation, and sitting in Hanna’s room I felt positively cushioned by art. When Andrew finished, C played her two pieces with competence and grace, a handful of mistakes perhaps, but a good spirit about it. She does not seem to be aware of the phrasings she is able to create with her music. Then Hanna turned to Yuri and invited her to take her turn, and I braced myself for her refusal. Yuri and I had time to talk this week, and she’d told me about trying to find a way to be a good worker yet reserve some time for cooking and piano and other pursuits, but from what she said I sensed that work was winning that tug of war, leaving little time for anything else. “I haven’t touched the piano for a year,” she had told me, which struck me as too sad to contemplate. So when Hanna said, “But I thought you were going to play!” I was amazed when Yuri stood, nodded, and sat down at the piano. At first everyone rushed to help locate the music for a piece she wanted to play for us, but it wasn’t in Hanna’s books. Someone propped a piece before her, but instead she played a Chopin prelude from memory, and with only a few starts and stops—“The first time was right!” came Andrew’s encouragement—she pressed on, and it was lovely. The music itself was a thing of beauty, of course, but more than that, far more, for me, was the beauty of seeing Yuri sitting down to play without practice, rehearsal, preparation, fuss, nor request for us to forgive her for any mistakes she might make—no apology, no drama; she just played. And that to me was the essence of courage, a creative spirit, all the more poignant for having been suppressed for the past year by the bank that employs her. And I longed to reach in and shake her life upright, alter her work culture so that she can leave at a decent hour and make time for music and cooking and herself. I wonder if others might at times want to do the same for me, back at home, when they hear me long for more hours in the day. Meanwhile I contemplated how far I’ve felt from any creative impulses lately, the joy of having visitors resulting in less time to sit and write, resorting to shorthand notes jotted down in stolen moments, not enough time in a boat or being active either, activities that are somehow related for me to creativity and a free mind. And in this space of feeling locked out of creativity, yet cushioned by the creativity all around me, I saw the evening from some outside view, as if I were trying to memorize every detail of the room and the people in it and the sounds they created and the pictures on the walls, so as to remember it more clearly at some point in the future. To recall, twenty years from now, this evening as if it were a scene from a film, and to see how wonderful this moment is, playing piano for one another, not in any sort of show-off way at all, but merely the pleasure of playing, sharing pieces, fighting whatever nerves each one feels, and just putting yourself out there. I respect that, immensely. Hanna played us four short dances by Schubert. She started learning to play the piano in retirement, so she doesn’t have the training the others have. But no matter; Hanna approached the pieces with the confidence and energy she seems to bring to everything in her life. I was inspired, as I often am, by her willingness to wade in and try something new in front of others for a while, taking comfort in the knowledge that with practice and dedication she will make the pieces sing. For now the beauty is in the effort and the pleasure of the journey. After everyone else, M got ready to play Opus 111, Beethoven’s last sonata. This is a piece M has worked on for years, so I know it well, but have never understood it. The sonata has a section that sounds like syncopated jazz, which seems impossible and out of place because it was composed in the 1820’s; it’s hard to imagine it can really be Beethoven. Our girls had slipped out of the room by this point to build towers out of Jenga blocks. M played as the sunlight faded outside the window and the room lights glowed warm and the street fair broke up on the sidewalk below us. Occasional sounds of crashing wooden blocks and laughter reached our ears from the next room. During the Beethoven I thought about the trip M, Andrew, Yuri and I had made to the Jewish Museum the day before, where the most moving places, I found, were the rooms left empty, dedicated to the art never created, the thoughts never thought, the music never played, the works never created by people who never had a chance. And the rest of the museum was in large part an ode to the nostalgic pleasures of domestic life: photographs of families around the dinner table, seated at the piano, playing violin in their living rooms for each other. The simplest scenes of domesticity yearned for, yet denied, during the darkest years. And it struck me as such a sin, I thought, sitting there listening to century-before-its-time Beethoven jazz, to have the good fortune to live freely and not create, to have a full life and reams of opportunity and not make something of it, not dare to make mistakes, not try something new, not live a full life. When M finished, we all applauded, but he turned our claps to laughter by crouching down and doing a headstand on the rug before us. Over dinner, Hanna told us about the painter who had created many of the paintings that hung on her wall, from whom she had purchased the pictures directly over the years. The artist is originally from East Berlin, she told us, and she spoke out against the government, so she was denied access to paint and canvas, the tools of her trade. Other artists she knew shared their art supplies with her so she could continue her work. She pointed to a bright yellow circle on a large abstract painting hanging above her couch and said she’d asked the artist about it. The painting must be 5’x5’; it’s the largest in her apartment. “That yellow circle could have ruined the painting,” she said. The rest of the picture could have been complete as it was, but the artist, after bracing herself with a good amount of wine, determined to squeeze yellow paint right out of the tube onto the painting, creating a neat circle. Only then could she call the work complete. I wonder if when I think of our Berlin year in the years to come this evening will be the one that comes to mind: the sheltering comfort of friends, being enveloped in yet shielded from the city (“Goebbels lived around the corner!” said Hanna); and the many subtle reminders of the imperative to nurture the creative impulses of those we love. The evening reminds me to encourage the dreams of those around me, even if I don’t understand them, in the hopes that they, in turn, might encourage my own. This entry was posted in Music - Opera and piano, Sabbatical, Writing and tagged art, Beethoven, Berlin, Chopin, East Berlin, Jewish Museum, Mozart, music, painting, piano on May 20, 2014 by Jill M.. Different circumstances, but common feelings, I suppose. I admire your art, Chris! Such a strong word — sin– and yet this resonates deeply. Thanks much. I am chastising myself in that section but I’m grateful to hear I’m not alone. Oh and also: the reason you may recognize that Beethoven tune that A played: Billy Joel used it for a song he called “This Night”. That Billy Joel song is so strange! I only learned of it in recent years. I wonder if some PBS documentary used it to accompany animal film footage; that’s what comes to mind anyway. Thank you for this, Jill. I will be printing out these words (also mentioned by Muddy River Muse): And it struck me as such a sin, I thought, sitting there listening to century-before-its-time Beethoven jazz, to have the good fortune to live freely and not create, to have a full life and reams of opportunity and not make something of it, not dare to make mistakes, not try something new, not live a full life. I am honored, Suzanne! Thanks for letting me know. Thanks for introducing me to that incredible poem — I just found and read it. Beyond that amazing last line, the word that gets me is “indifferently” — I think that’s what I’m railing against, my own indifference to whether I make anything of this life, and having the dawning realization of the courage it took for others to do so. Wondering whether I can sustain the courage and will to do the same. Maybe if we lean more heavily on the buddy system we can sustain each other through the tight spots.